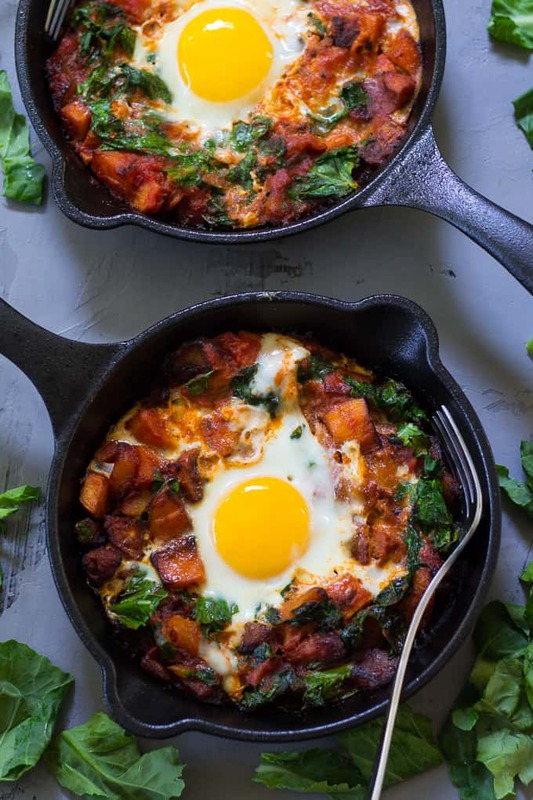 There is so much hearty flavor is this savory Chorizo Butternut Pizza Hash that it’s sure to become a favorite dish for any time of day! 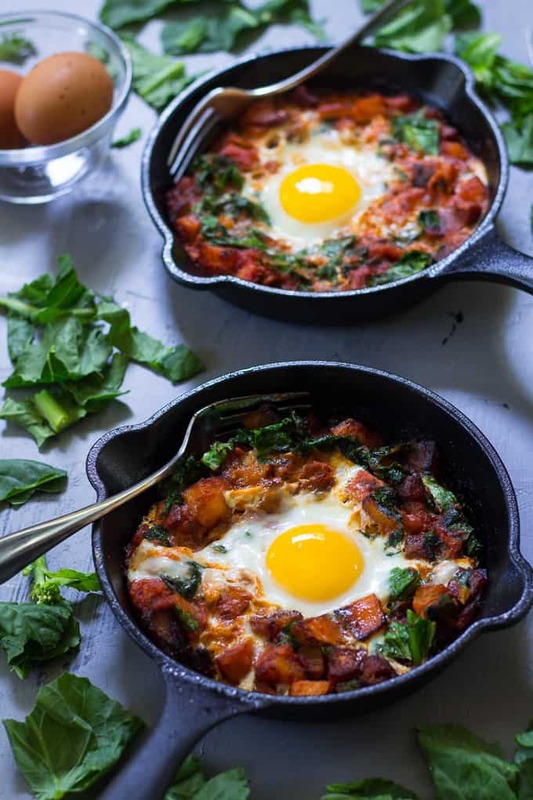 Diced butternut squash is cooked with chorizo until toasty brown and then baked with spinach, pizza sauce and eggs. 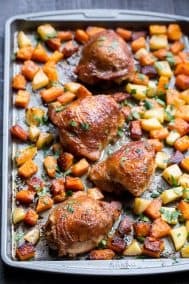 It’s paleo and Whole30 friendly, and ready in 20 minutes! Guys, I wouldn’t want you to forget about my undying love for sausage. Without it, half my recipes wouldn’t exist in the first place. This one is no exception! Whether it’s sweet italian, andouille, chorizo, or breakfast sausage, I sort of feel like I could just go on about it like Bubba from Forest Gump did with shrimp. Sausage is really good with shrimp, too. Okay, back on topic. You know what else I’ve always loved, because I’m human and not just a paleo ET? That would be pizza. Living in Queens as a kid eating some of the best pizza in the world (my opinion) there’s no way I could escape a burning love for pizza. In fact, sausage pizza was my number one favorite, if someone had made me choose, for most of my life. Spinach, too, believe it or not! Anyway, I’m sort of on the impulsive side so after staring at pizza I decided to cook up a little version of my own, except in a hash, because it’s easy, quick, and super nutritious. 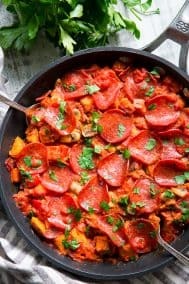 This Chorizo Butternut Pizza Hash is both Paleo and Whole30 friendly, as long as your sausage does not contain added sugar. I purchased mine from Whole Foods, but I’ve found many local grocery stores who make their own sausage will not add sugar. 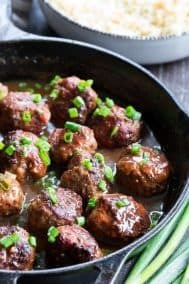 I chose chorizo for this recipe rather than Italian sausage for no reason other than it looked really awesome in the store and I haven’t had it in a while. A spicy Italian sausage would also work really well, and, of course would be more authentically Italian. I’m going to be honest, any spiced meat makes me happy and whatever you decide to use for this is sure to be delicious! 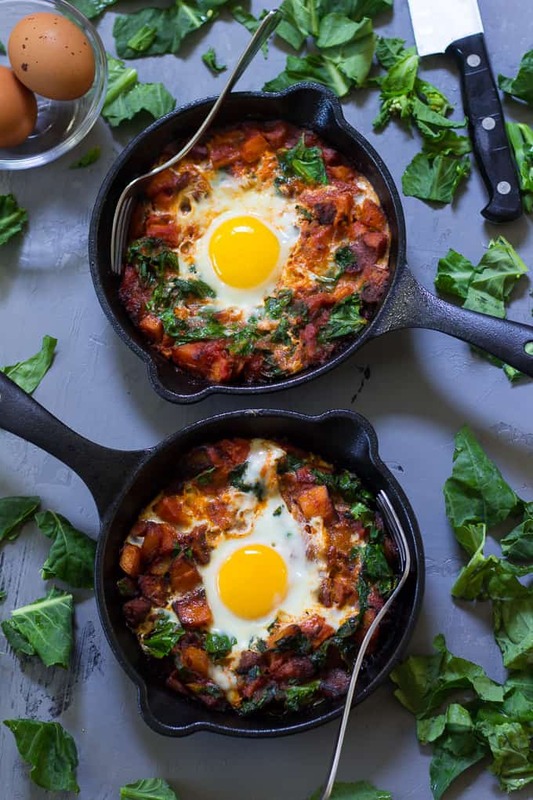 A savory chorizo butternut pizza hash with spinach and baked eggs. 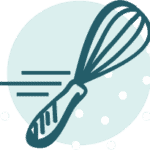 Paleo and whole30 friendly, gluten free, grain free, and dairy free. 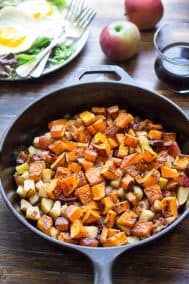 Once the skillet is hot, add the diced butternut squash and cook, stirring occasionally, until it is a light toasty brown. Once the butternut begins to brown, add the chorizo to the pan (remove the casing first if it has one) and stir. Add the crushed red pepper and oregano as well as you cook. Add the pizza sauce and spinach and stir to combine. Cook and stir for a minute or 2 until heated through. To add the eggs, create grooves where you will put each egg and carefully crack each one into the space. Sprinkle salt and pepper over them to taste. 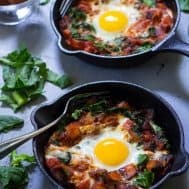 Put the skillet in the oven to allow the eggs to bake into the hash until cooked to preference, 5-15 minutes depending on how well done you'd like them. Once eggs are cooked, remove from oven and let the skillet sit for 5 minutes before serving. 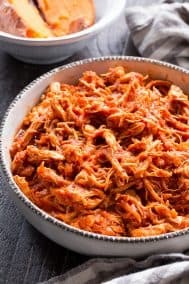 Serves 2-4 people and will save well for leftovers. Enjoy! 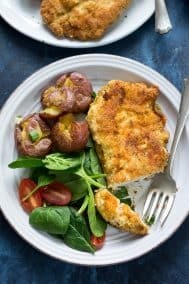 **I have made this recipe using this larger skillet as well as these two small cast iron skillets. Keep in mind that the heat will need to be lowered/adjusted if you use smaller skillets, since they heat more quickly. What’s one food you could go on and on about, Bubba style? What’s the best pizza you’ve ever had/where was it from? New York, hands down, has the best pizza anywhere. Maryland pizza does not compare! My favorite pizza is from Grimali’s in Garden City, but I know Queens has good pizza too! Glad you are finding some options that you can enjoy! Don’t think I’ve ever had that, which is surprising since I worked in Garden City for a while. I have to agree with you that NY is just the best, it will always have my heart! It’s so hard to choose which is the best pizza here since as you said, NY is the best! I really love La Scala for their original slice but I adore Monte for their vegetable whole wheat crust pizza. Piccolo in Bellmore has always been awesome and unique and I love a good grandma slice from just about anywhere out here. Ha, I could talk pizza I guess all day long. All of these people keep talking that NYC has the best pizza. Apparently they’ve never been to Italy! Is it weird that the best pizza I’ve had was NYC style, but not IN NYC? Weird. I love chorizo (as does Alex) and we used to have it a lot (for him–I can’t really have sausage). And you know how I feel about pomodoro sauces!!! give me a spoon, walk away, no one gets hurt! It’s true, I’ve never been to Italy! So NY it is for me 🙂 Truth told I love a chicago deep dish though, yummo! 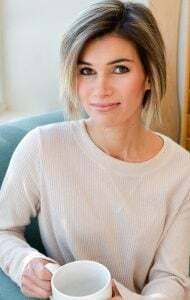 You know I used to love pizza but in my 30s I stopped loving it so much. I can’t remember the last time I had it. Now this pizza though with shredded butternut squash I could ear daily! Yum! We are definitely biased with where we’re from 🙂 And I agree nowadays I’ll take this in a heartbeat! Hubba Hubba! This is my kinda meal! I think I need to start cooking more in a skillet. This looks absolutely incredible. I do not miss much in terms of meat, but chorizo… so yummy! I buy the vegetarian chorizo sausages sometimes but it’s truly just not the same. Haha. YUM!!! !I love pizza and try to make mine healthy (as healthy as I possibly can, anyway!) so this looks amazing!!! I ove sausage too and really haven’t made it in a while, I’ve got to change that! Pizza will always be a favorite! 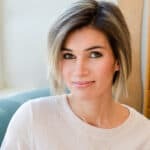 I have a bunch of awesome ways to do it (that I need to post! ), but I think my favorite will always be on the grill! This looks AMAZING. My husband is a chorizo FIEND and he would love this. It’s good stuff, don’t blame him one bit! Pizza is one of my top loves as well… but then I’ll go for long stretches without having any, have some, and wonder why the heck I don’t eat it more often. Story of my life with basically every food 😆 Except maybe oatmeal. And chocolate. And now jelly beans. Oh! And most Mexican foods. What can I say? I have a serious weakness for salsa and guacamole. 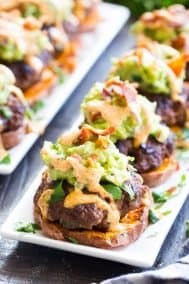 Loaded nachos are another thing that will always have my heart, with lots of guac! I also go in phases with everything, except maybe eggs and sausage, since I’ve always eaten both of those since the beginning of time. Nowadays it’s admittedly a lot more though! Anything with pizza in the name has my attention. I love the spicy twist here too. 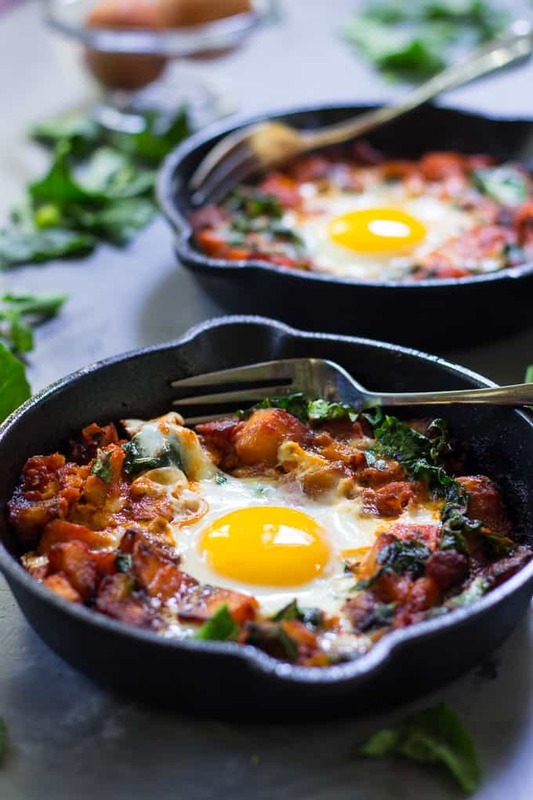 I love all egg based dishes… this looks right up my alley! I could go on an on about sushi, but I won’t because I may have already overdone it on my blog ;). I honestly cannot remember ever having a really good, memorable pizza. This is quite sad. One day I will fly to New York and get myself the real deal! I’m biased, but chicago deep dish is the best! Especially Giordanos! 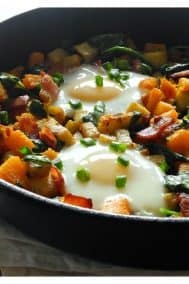 Love the use of butternut squash in a hash to keep it healthful and protein-packed! Would acorn squash work as well?